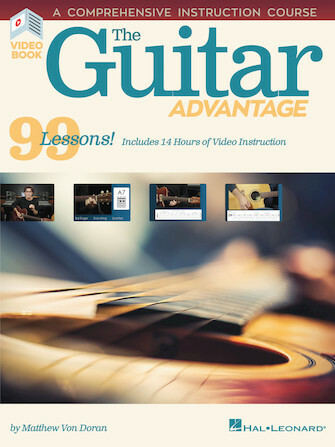 This comprehensive book and video instruction course includes 99 lessons to show you how to play guitar! 14 hours of professional video instruction helps you focus on one concept at a time so you'll be making music after only a few lessons. The course is excellent for complete beginners, as well as experienced players who want to fill in the missing skills they need to take their playing to the next level! Bonus lessons and etudes with demonstration videos and play-along audio tracks are included, as well as video lessons that address goal setting, effective minset, time management and more. Every musical example is written out in tab notation, with fretboard and chord diagrams.